Disclaimer- I am a Christian Southern Republican. There that’s warning enough. This being my third time up to bat at 26 I do not have tons of life experience; but I have enough education and know how to make my informed decisions. I have a college degree and graduated with honors (so I can’t say I am stupid, neither can you). But here is my take; take it for what it is worth or not. The country of the United States of America is a ME country. It’s not just a generation; it’s the whole country. We have been spoiled and pampered. We have everything we could ask for and in abundance. The age of my grandparents of hard work and the depression is a dying generation. The last to know what scraping by really means. I am thankful two of mine are still living in their 80’s; because I can get a dose of reality in just a short drive down the street. In my nice Honda; with radio,a coke, nice clothes I washed at home in my fancy washing machine and dryer, with my iPhone and Coach purse in the passenger seat, and baby in the top of the line carseat, and carters outfit with new shoes from target. Get the picture, I am spoiled as well. With that being said; we are so blessed as a country, we forget that it wasn’t so easy before. Because of our human nature, we want it all and everything that feels good. No longer are we concerned with what is “right” we want to do what feels good “right now”. We have forgotten the foundations of our country and who has blessed it so richly. Instead we are more concerned with what our desires are. I believe that unless something drastic changes in our society that brings us back to morals then we will continue down our path. Sin feels good; if it didn’t feel good then we would not partake in it. Also I should note that there is no sin greater than another. So my sin is just as bad as your sin; not just your toes getting stepped on here. Our human nature is to sin, that is why we have the problems with crime today; and it is also why we are headed in a downward spiral as a country. Until we wake up and smell the stench of sin and Godless-ness in our country, we will continue to see leaders elected that will approve of sin, or will do nothing about it. A monkey could run for office with the backing of a party that supports those issues that feel so good to us but are none the less Sinful nature. Now I am not calling Obama a monkey; I am making a point that no matter who you put in front of the nation, many will vote because they want to continue in their sin. And as a Christian, a sinful imperfect Christian. I know where my vote will always be, call me close-minded, homophobe (which is crazy to say, if you know me then you will know otherwise), call me crazy redneck southerner (can’t call me stupid remember), and you can call me intolerant. I don’t have to answer to you; or to any one man. I have to answer to my Heavenly father; and that is the mindset our society is missing. 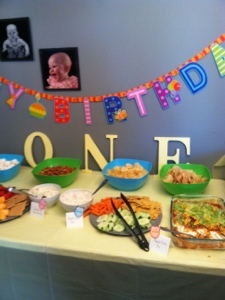 For Macayla’s first birthday I decided to do a “dip bar” for our guests. Why dip? I thought it would be different from the mundane kid party foods and quite frankly was not going to pay tons of money to serve a full meal (it was in the middle of the afternoon for this purpose). We went with the usual Craig dip which I so lovingly name “Poppies Dip.” It is simple and delicious and well we eat it at every Craig get together because we love our chips and dip. Let me wow you; it’s two ingredients and one day you will thank me because it is better than any store bought chip dip out there; sour cream and onion soup mix. 16oz of sour cream to one packet of mix; best if you let it sit for a few hours in the fridge. The next two dips were thanks to Pinterest; that place is addicting wonderful! I served them with Marshmallows; strawberries, cantaloupe; pretzels and graham crackers. YUM! Check out the awesome spread! I had chosen to Breastfeed Macayla; I had no goals other than we were going to try. So I had not resumed my cycle; I had ovulated but it was sporadic but nothing else. This time I was on the pill; the mini pill. I took it like clock work (you have to or it does not work at all). Within the last two months Macayla has been slowing down and nursing less frequently so I knew my cycle would have to return and I could change my BC. This is why I took a test; I took it because I wanted to be sure before I called the doctor for a switch. 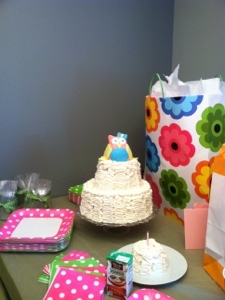 To my surprise; the morning of my daughters first birthday party; I would get a Positive test. It took 20 seconds and there it was. I laughed; again! This time I knew better than to ask God what He was thinking: I said “You do have a great Sense of Humor! You made this happen when it really shouldn’t have been possible; yep this is your baby!” 2 years difference growth; and now I am going to have another Gift. WAIT… How far along am I exactly?! All I had to go off of was a negative test at the beginning of July. 2 months; a few weeks? Was the test I took in July a false negative? Is there more than one? Questions I have asked myself for almost 4 weeks now. We had to wait for an ultrasound; a long wait for me as I wanted to know. Today we got to see who was in there; just a little peanut 7weeks 5 days. My babies will be 19 months apart; God you sure do have a Sense of Humor; but I wouldn’t want it any other way! Finally getting to sit down and explain our surprise babies! Mitchell and I were Married in May of 2010; and had planned on trying for Babies a year or so after we were married. We both wanted children; one of the first questions I asked on our first date. I know it’s deep to ask someone but I wasn’t going to have my heart broken 8 months down the road if He didn’t want to have children. Before we were married I had some female medical issues and it changed my cycle; before I was like a clock. Knowing this; Mitchell and I still felt that because we are married whatever happens does. About two months after we were married; I was late. I took a test -negative! I was relieved but I cried secretly because my desire to be a mother was strong. After that nothing was abnormal and I accepted that I was not working like a clock anymore. We finished the summer and made it through fall and no major discussion of Babies. We both knew it was a sensitive subject and just to leave it alone. Along comes December; the busiest season for us as we tried to find a way to see all of our families. I was sitting at work on the 21st of December; talking with a co-worker about plans and it hit me. I asked what day it was; she looked at me like I was silly… “Monday the 21st Mel!” “Really? !” I said. Again I got what’s going on in your head look. “I need to take a test.” With the crazy of the holidays approaching I had not realized I was late; very late in fact. That night I didn’t sleep hardly at all; I should have just taken the test when I got home from work. I didn’t say anything to my Husband because I thought I could possibly surprise him Christmas morning; that is if it was positive. 6:23am I couldn’t hold it any longer; I peed on the stick. Funny how time stands still those few seconds it took for it to show; I had all emotions running high; but I just knew that this time it was different. Positive! It took maybe 25 seconds to appear; and that’s it. I laughed! God what were you thinking? We aren’t ready for a baby; we wanted to do so much more before a baby. I now know what God was thinking; but more on that in a different post! 7 months after getting Married; unprepared for a baby; and blissfully happy to become a Mother! 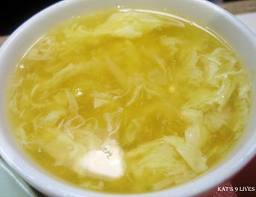 My Husband loves Egg Drop Soup; my inspiration for attempting this seemingly interesting concoction of egg and thick goop. As we are both preparing for Charlotte 714; we are fasting from different things. I have chosen soda, no small feat for me as I love an ice cold coke and more than coke a yummy Dr. Pepper. Mitchell has decided to fast from meat; which has made cooking dinner an interesting adventure. After much debate we could not settle whether eggs are meat or a By-product like cheese and milk. So he has been eating eggs occasionally. Put all but 1/2 cup of broth in a saucepan and add spices; bring to a boil. In a bowl or cup mix remaining broth with the cornstarch, make sure there are no lumps. In separate bowl, beat the eggs and yolk together. When the broth is boiling add in the cornstarch mixture first; then slowly add egg mix while stirring. Remove immediately from heat. It has been years since I sat down to write; an art that I had let slip with the onslaught of adult life. Marriage; work; and now a one year old have changed my life and perspectives on many things. I hope to share them here as well as things that I enjoy. Stay tuned for many updates on my adorable daughter, successful attempts at recipes, and crafty projects that drive my Husband insane. For now a serious topic of my life; Being Bold! As a Christian; and I mean bible believing, born again, Jesus is the only way to Heaven, I can’t help notice that Christians have lost their boldness. Yes, there are “Reverend SongBird” types; let me explain that: in college there was a preacher that would come shout condemnation to anyone walking by; for flip flops, jeans, long hair, and anything he could find. We called him Songbird; and he got plenty of attention. This however is not the Bold I am talking about. I am talking about in our workplaces, with our friends, with our teachers. It is easy to be Bold at church but are you bold at home? We are called to be salt and light; are we that at our most intimate places? How about on FB; and I am not saying the share if you love Jesus pictures. Are we sharing God’s love, are we standing by His rules? Being Bold for Christ; is not about keeping everyone happy on your friends list, or trying to keep harmony with friends at home (or even family); it is knowing there is NO Gray area in the bible; there is right or wrong. Being Bold is being honest in Love about biblical truths; it is inviting to church whenever you can. Being bold is sharing the Gospel; being bold is being Couragous even in the face of adversity. To long I have sat on the side lines; sitting on the fence because I was afraid to offend or loose people in my life. I want to live Boldly, I have to live Boldly because I care to much not too!